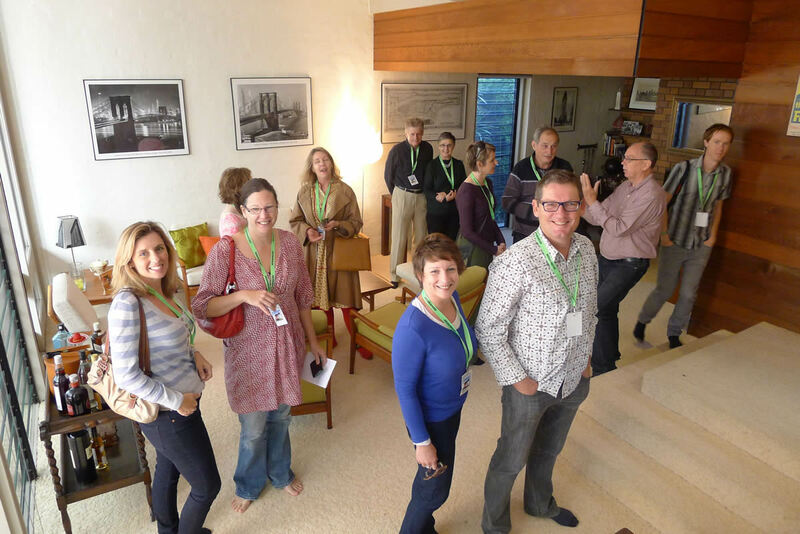 Our modernist architecture and design MAD Weekend was a huge success, including many new faces in the crowd. It was a stellar line-up on Friday night for 20/20 Vision, including local award winning architects Stuart Vokes, Bud Brannigan and Brian Steendyk. Our hostess Susan led off the proceedings with a unique Go-Go routine and slide show of Pucci fashion for Branniff Airlines c1960s. Some of the other highlights were: Judy showed us the recent past with images of Gold Coast motels. Two very different jewellery designers, Robyn (QLD) and Genevieve (NSW), featured funky examples of their work. Marcus (Tiki Beat) presented the evolution of Tiki bars in the USA, with a sneak preview of his new Tiki Bar design in WA. Paul illustrated the glamour of travel with a colourful selection of early Australian travel posters. Marg shared her experiences of Japanese culture. Annalisa proudly showed us images of her 1957 Sulman award winning house (NSW) designed by Russell Jack. For the night owls there was an up-late movie screening of Futuro, the fibreglass fantasy home that failed. Saturday night began as a social evening with cocktails, followed by a feast of finger food and friendly chatter. Our guest speaker architect Geoffrey Pie promised to keep to the time schedule, and he very nearly did! Geoffrey managed to squeeze 50 plus years of images and experience into just over an hour, with only a small amount of heckling from his own family. Greek desserts and coffee completed the nights menu, before we settled in for a late night movie, a documentary on modernist architecture. Brisbane turned on a perfect winters day as the crowd gathered at the first house in Aspley for the Sunday morning house interiors tour. This was also the event that attracted most newcomers, and they were not disappointed. We examined 4 houses which covered a variety of design themes, modular and modest, cool contemporary, classic mid-century, and a modernist marvel. The other houses were in Ashgrove, Tarragindi and Carina, and none of this would have been possible without the wonderful owners, a special thankyou to all of them. Our final stop on the tour was lunch at Can You Keep A Secret, a unique vintage clothes boutique in Greenslopes. Some of us recounted the weekends activities over a basket lunch, while others did a little vintage shopping. Thankyou for supporting the amazing MAD Weekend, it was interesting, entertaining, and a little bit crazy and a lot of fun. I look forward to seeing everyone again at future Australian Modern events.